"At the risk of being accused of being a bah-humbug Christmas hater, the amount of money we pour into that day is ludicrous. I just don't get it." We're going through the same debate in our family. 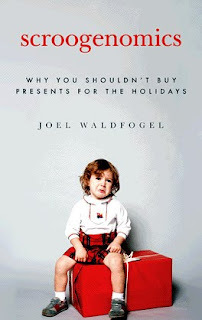 I wrote about it here, quoting this guy, Joel Waldfogel who has now published a book, Scroogenomics: Why You Shouldn't Buy Presents for the Holidays. "Christmas is a time of seasonal cheer, family get-togethers, holiday parties, and-gift giving. Lots and lots--and lots--of gift giving. It's hard to imagine any Christmas without this time-honored custom. But let's stop to consider the gifts we receive--the rooster sweater from Grandma or the singing fish from Uncle Mike. How many of us get gifts we like? How many of us give gifts not knowing what recipients want? Did your cousin really look excited about that jumping alarm clock? 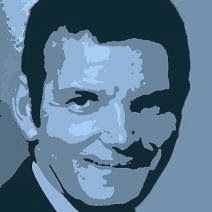 Lively and informed, Scroogenomics illustrates how our consumer spending generates vast amounts of economic waste--to the shocking tune of eighty-five billion dollars each winter. Economist Joel Waldfogel provides solid explanations to show us why it's time to stop the madness and think twice before buying gifts for the holidays." Bah! Humbug to Joel, I say. "We continue to give presents notwithstanding what may be their economic inefficiency. We like to be pampered, and usually we're too stingy to do it ourselves. I know exactly the double CD I want for Christmas, and I have dropped a fairly unsubtle hint about it. Normally I'd be reluctant to spend the money, but at a time of indulgence, what the heck? And the look of pleasure on my wife's face at the look of surprise and pleasure on mine will make it all worthwhile."